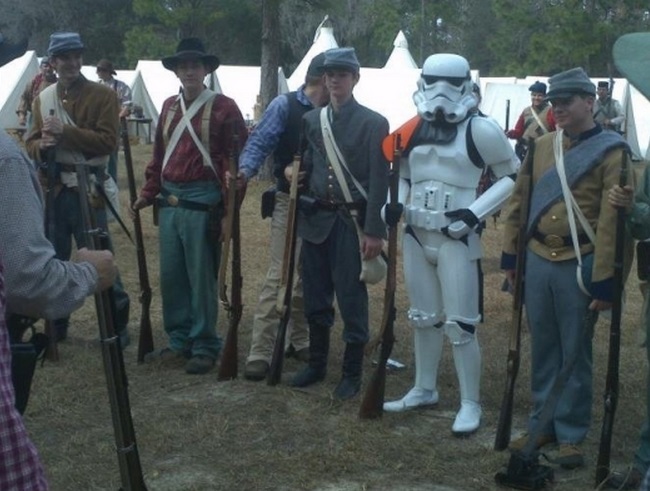 What happens when living history interpreters allow the lines between the past and present to blur a little? When they don’t break character, but they definitely crack it? I’m always a bit skeptical of living history and (re)enactment experiences. I don’t dislike them by default, but growing up between the Revolutionary War reenactment-happy towns of Lexington and Concord, MA definitely left me a little (authentic Flintlock musket) gun shy. For the positive experiences I had, there were always people who took their historical roles too seriously. Think South Park’s Pioneer Village, but with fewer murders. So I was pleasantly surprised a few months ago when, while in Edinburgh, I went on a tour of The Real Mary King’s Close and had an excellent enactor-lead experience. The website for the Close advertises tours facilitated by “a costumed character tour guide based on a one-time resident.” Possible guides include Walter King, a 17th-century Foul Clenger (eww), Agnes Chambers, a 16th-century maid, and Robert Ferguson, an 18th-century poet. Our tour was led by Jonet Nimmo, a 17th-century lady – and Mary King’s daughter – who grew up in the Close (unfortunately, I didn’t catch the enactor’s real name). Throughout the tour we heard stories about the close and about Nimmo’s life growing up in it. And while the design and narrative of the tour were both very good, it was the presenter’s willingness to shift in and out of strict character as the moment called for that made the visit so refreshing. Here are a few of the highlights I managed to scribble down as we walked through the Close. (Upon entering a recreated bedroom where the occupant has recently died of the plague). And, as we now know, it wasn’t bad smells that made people sick. Because, over here, of course, is the real culprit of the plague. Big plastic rats! For all you historical buffs, if you like plaster – and who doesn’t? – there’s a lovely old bit of it right over here. This floor board here, well, this is Ikea. But underneath it is an original one. Gotta love original floorboards! In case you think the above side comments sound sarcastic, they weren’t. The guide was simply saying what most of us were thinking. It was a really plastic rat. The enactor stepping out of character didn’t break the illusion, because in spaces like the Close, and most other living history sites, the illusion is never fully there to begin with. Instead, the enactor’s ability to find ways to comment on her character and the stories she was telling actually made the experience feel more immersive to me, rather than less. Her acknowledgement of and commentary on some of my internal monologue allowed me to move past potential distractions (seriously, the rat was so plastic) and refocus on the larger stories and bigger picture. I’d be so curious to see how this kind of flexibility – an 80/20 approach to accuracy with allowances for side commentary – could be applied to other areas of interpretation. Done correctly, it could be so much fun. Have you come across this presentation/interpretive style before? Do you like the idea of breaking the fourth wall in museums/historical sites/interpretive opportunities, or are you more of a purist? Break that fourth wall! I hate it when enactors refuse to break character: ‘say, what’s that little box you’re hitting with your thumbs? It must be a magical device!’ and so on. Your ‘Jonet Nimmo’ sounds like a joy.